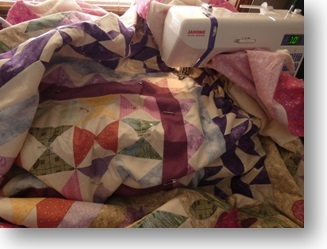 The intimidation I felt about quilting a large quilt on my teensy, little Janome sewing machine was unfounded. I can say that now, now that I’ve started those first stitches. I am happy to say that since my decision three days ago to bite the bullet, I am really pleased with how it is going. It has been more than a year since I’ve finished this quilt, the Garden Charm quilt from a Lynette Jensen’s pattern in a Craftsy Class. It is just the kind of quilt that will be fun to quilt because there are so many pieces and so many designs that are just ripe for stitching. A few weeks ago I pin basted this quilt with every intention of starting on the quilting right away. One thing or another got in the way of that, but I have finally gotten to it. In fact, finishing this quilt was as close to a New Year’s Resolution as I’ll ever come. I must say, I am really pleased that this isn’t as bad as I thought. In fact, it isn’t bad at all. I was a little terrified about the sheer bulk of fabric that I had to push beneath my needle, but as long as I take it slow, it seems to work just fine. There probably is more maneuvering than actual sewing, but that is because I’m starting in the very middle. It will get easier as I work toward the edges. 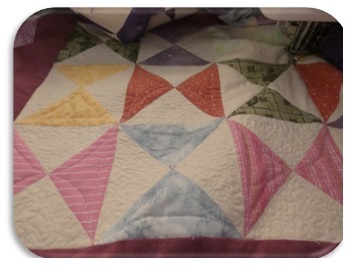 I worried about my small quilting space, wondering if it could accommodate a quilt of this size. But, in reality, my quilting space is perfect. It is a small breakfast counter, which offers room behind and to the left of my machine. Beneath the counter, I store my ironing board. When I quilt, I pull the ironing board out, which is just at the right height. Between the ironing board and the counter top, it is easy to handle the entire weight of this unwieldy amount of bulk. The first thing I did was stitch-in-the-ditch around the center medallion, which consists of several small hourglass blocks. I didn’t think it would even be possible to move the quilt enough to stipple, which requires a fair amount of movement of the quilt, but as illustrated, it was quite easy to get a large enough space in which to work. I feel as though I’ve crossed a hurdle and am happy to say that finishing this quilt is no longer daunting. In fact, I’m looking forward to working on it. I’m so happy to say that quilting is enjoyable again. I have no idea what quilt designs I am going to use, but that will be half the fun.